This tonneau cover has an average rating based on 33 customer reviews.
" I�ve order a couple regular roll up covers from here before and now decided to try the tool box cover. Same great product and easy to install. 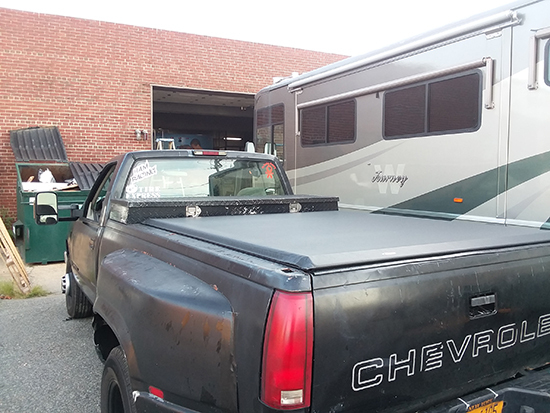 No complaints at all "
" Back in 2007 I purchased the Access toolbox tonneau cover for my new 2007 GMC Sierra 2500HD and has worked flawlessly. Now in 2019 I had to replace the cover as the edges started to wear and fray in spots. My new Access Cover was a breeze to replace on the existing hardware. My GMC truck now has 378,000 miles on it and a new Access tool box tonneau cover. Looking forward to the next 12 years. I also put an Access full tonneau on my 2013 Ford F-150 which now has 153,000 miles. Access covers and their customer service are AWESOME! " " I love, love this access cover. It was super easy to install, it makes my truck look fantastic, and it keeps my great secure. Thank you ACI "
" Easy install, perfect fit. I would highly recommend this product "
" The cover fit well, even with my tool box. I am very happy with it. Great product. Will keep all the Idaho snow out of my pick-up during the winter! " " Product worked perfect. Easy to install. " " Hi, this is the second toolbox access cover I have purchased (does that mean I get 20% off the next one ?) It's a great cover and I'm convinced yours is one of the best if not the best. You are the only company which offers the toolbox cover and hope you continue to offer that tonneau cover. Thank you, Mark Thompson "
" Great now all my tools are covered and safe from winter weather. Installed with minimum tools and great fit "
" Great quality easy install. I Have reccomended to 3 people so far. Having a single cab truck i needed to keep my toolbox and this gave me the opportunity to. " " Quality product and looks great on the truck. Wish it sealed better, but it performs as advertised. "